Download "Avoiding the Disk Bottleneck in the Data Domain Deduplication File System"
1 Avoiding the Disk Bottleneck in the Data Domain Deduplication File System Benjamin Zhu Data Domain, Inc. Kai Li Data Domain, Inc. and Princeton University Hugo Patterson Data Domain, Inc. Abstract Disk-based deduplication storage has emerged as the new-generation storage system for enterprise data protection to replace tape libraries. Deduplication removes redundant data segments to compress data into a highly compact form and makes it economical to store backups on disk instead of tape. A crucial requirement for enterprise data protection is high throughput, typically over 100 MB/sec, which enables backups to complete quickly. A significant challenge is to identify and eliminate duplicate data segments at this rate on a low-cost system that cannot afford enough RAM to store an index of the stored segments and may be forced to access an on-disk index for every input segment. 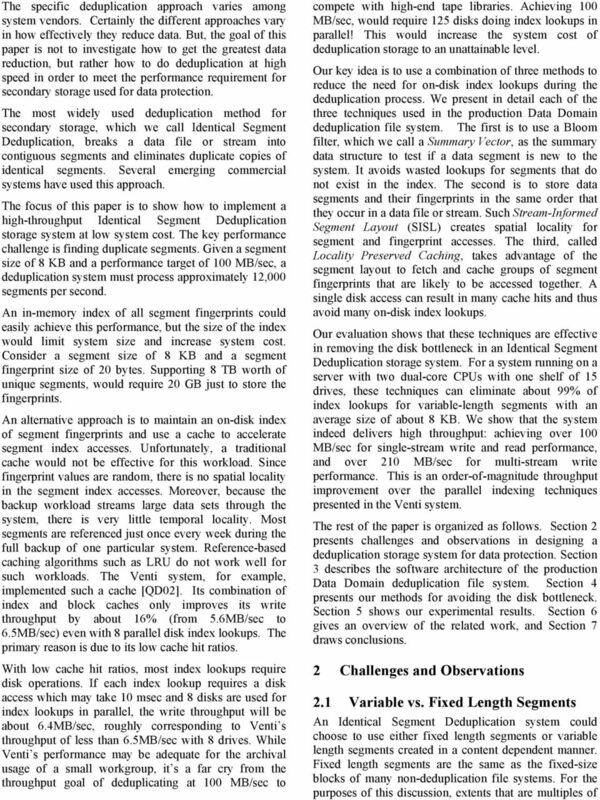 This paper describes three techniques employed in the production Data Domain deduplication file system to relieve the disk bottleneck. These techniques include: (1) the Summary Vector, a compact in-memory data structure for identifying new segments; (2) Stream-Informed Segment Layout, a data layout method to improve on-disk locality for sequentially accessed segments; and (3) Locality Preserved Caching, which maintains the locality of the fingerprints of duplicate segments to achieve high cache hit ratios. Together, they can remove 99% of the disk accesses for deduplication of real world workloads. These techniques enable a modern two-socket dual-core system to run at 90% CPU utilization with only one shelf of 15 disks and achieve 100 MB/sec for single-stream throughput and 210 MB/sec for multi-stream throughput. 1 Introduction The massive storage requirements for data protection have presented a serious problem for data centers. Typically, data centers perform a weekly full backup of all the data on their primary storage systems to secondary storage devices where they keep these backups for weeks to months. In addition, they may perform daily incremental backups that copy only the data which has changed since the last backup. The frequency, type and retention of backups vary for different kinds of data, but it is common for the secondary storage to hold 10 to 20 times more data than the primary storage. For disaster recovery, additional offsite copies may double the secondary storage capacity needed. If the data is transferred offsite over a wide area network, the network bandwidth requirement can be enormous. Given the data protection use case, there are two main requirements for a secondary storage system storing backup data. The first is low cost so that storing backups and moving copies offsite does not end up costing significantly more than storing the primary data. The second is high performance so that backups can complete in a timely fashion. In many cases, backups must complete overnight so the load of performing backups does not interfere with normal daytime usage. The traditional solution has been to use tape libraries as secondary storage devices and to transfer physical tapes for disaster recovery. Tape cartridges cost a small fraction of disk storage systems and they have good sequential transfer rates in the neighborhood of 100 MB/sec. But, managing cartridges is a manual process that is expensive and error prone. It is quite common for restores to fail because a tape cartridge cannot be located or has been damaged during handling. Further, random access performance, needed for data restores, is extremely poor. Disk-based storage systems and network replication would be much preferred if they were affordable. During the past few years, disk-based, deduplication storage systems have been introduced for data protection [QD02, MCM01, KDLT04, Dat05, JDT05]. Such systems compress data by removing duplicate data across files and often across all the data in a storage system. Some implementations achieve a 20:1 compression ratio (total data size divided by physical space used) for 3 months of backup data using the daily-incremental and weekly-full backup policy. By substantially reducing the footprint of versioned data, deduplication can make the costs of storage on disk and tape comparable and make replicating data over a WAN to a remote site for disaster recovery practical. 3 some underlying fixed size unit such as a disk sector are the same as fixed-size blocks. Variable-length segments can be any number of bytes in length within some range. They are the result of partitioning a file or data stream in a content dependent manner [Man93, BDH94]. The main advantage of a fixed segment size is simplicity. A conventional file system can create fixed-size blocks in the usual way and a deduplication process can then be applied to deduplicate those fixed-size blocks or segments. The approach is effective at deduplicating whole files that are identical because every block of identical files will of course be identical. In backup applications, single files are backup images that are made up of large numbers of component files. These files are rarely entirely identical even when they are successive backups of the same file system. A single addition, deletion, or change of any component file can easily shift the remaining image content. Even if no other file has changed, the shift would cause each fixed sized segment to be different than it was last time, containing some bytes from one neighbor and giving up some bytes to its other neighbor. The approach of partitioning the data into variable length segments based on content allows a segment to grow or shrink as needed so the remaining segments can be identical to previously stored segments. Even for storing individual files, variable length segments have an advantage. Many files are very similar to, but not identical to other versions of the same file. Variable length segments can accommodate these differences and maximize the number of identical segments. Because variable length segments are essential for deduplication of the shifted content of backup images, we have chosen them over fixed-length segments. 2.2 Segment Size Whether fixed or variable sized, the choice of average segment size is difficult because of its impact on compression and performance. The smaller the segments, the more duplicate segments there will be. Put another way, if there is a small modification to a file, the smaller the segment, the smaller the new data that must be stored and the more of the file s bytes will be in duplicate segments. Within limits, smaller segments will result in a better compression ratio. On the other hand, with smaller segments, there are more segments to process which reduces performance. At a minimum, more segments mean more times through the deduplication loop, but it is also likely to mean more ondisk index lookups. With smaller segments, there are more segments to manage. Since each segment requires the same metadata size, smaller segments will require more storage footprint for their metadata, and the segment fingerprints for fewer total user bytes can be cached in a given amount of memory. The segment index is larger. There are more updates to the index. To the extent that any data structures scale with the number of segments, they will limit the overall capacity of the system. Since commodity servers typically have a hard limit on the amount of physical memory in a system, the decision on the segment size can greatly affect the cost of the system. A well-designed duplication storage system should have the smallest segment size possible given the throughput and capacity requirements for the product. After several iterative design processes, we have chosen to use 8 KB as the average segment size for the variable sized data segments in our deduplication storage system. 2.3 Performance-Capacity Balance A secondary storage system used for data protection must support a reasonable balance between capacity and performance. Since backups must complete within a fixed backup window time, a system with a given performance can only backup so much data within the backup window. Further, given a fixed retention period for the data being backed up, the storage system needs only so much capacity to retain the backups that can complete within the backup window. Conversely, given a particular storage capacity, backup policy, and deduplication efficiency, it is possible to compute the throughput that the system must sustain to justify the capacity. This balance between performance and capacity motivates the need to achieve good system performance with only a small number of disk drives. Assuming a backup policy of weekly fulls and daily incrementals with a retention period of 15 weeks and a system that achieves a 20x compression ratio storing backups for such a policy, as a rough rule of thumb, it requires approximately as much capacity as the primary data to store all the backup images. That is, for 1 TB of primary data, the deduplication secondary storage would consume approximately 1 TB of physical capacity to store the 15 weeks of backups. Weekly full backups are commonly done over the weekend with a backup window of 16 hours. The balance of the weekend is reserved for restarting failed backups or making additional copies. Using the rule of thumb above, 1 TB of capacity can protect approximately 1 TB of primary data. All of that must be backed up within the 16-hour backup window which implies a throughput of about 18 MB/sec per terabyte of capacity. 5 sequence of client data bytes and has intrinsic and clientsettable attributes or metadata. An object may be a conventional file, a backup image of an entire volume or a tape cartridge. To write a range of bytes into an object, Content Store performs several operations. Anchoring partitions the byte range into variablelength segments in a content dependent manner [Man93, BDH94]. Segment fingerprinting computes the SHA-1 hash and generates the segment descriptor based on it. Each segment descriptor contains per segment information of at least fingerprint and size Segment mapping builds the tree of segments that records the mapping between object byte ranges and segment descriptors. The goal is to represent a data object using references to deduplicated segments. To read a range of bytes in an object, Content Store traverses the tree of segments created by the segment mapping operation above to obtain the segment descriptors for the relevant segments. It fetches the segments from Segment Store and returns the requested byte range to the client. 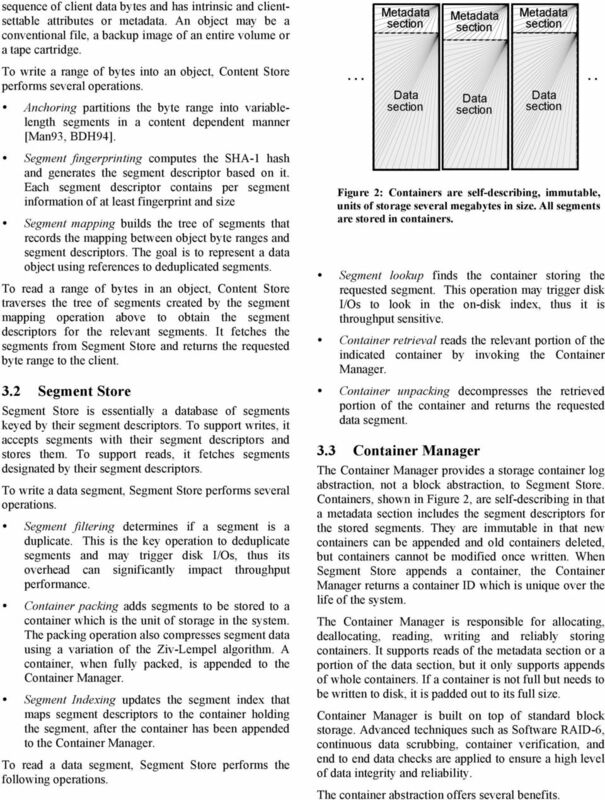 3.2 Segment Store Segment Store is essentially a database of segments keyed by their segment descriptors. To support writes, it accepts segments with their segment descriptors and stores them. To support reads, it fetches segments designated by their segment descriptors. To write a data segment, Segment Store performs several operations. Segment filtering determines if a segment is a duplicate. This is the key operation to deduplicate segments and may trigger disk I/Os, thus its overhead can significantly impact throughput performance. Container packing adds segments to be stored to a container which is the unit of storage in the system. The packing operation also compresses segment data using a variation of the Ziv-Lempel algorithm. A container, when fully packed, is appended to the Container Manager. Segment Indexing updates the segment index that maps segment descriptors to the container holding the segment, after the container has been appended to the Container Manager. To read a data segment, Segment Store performs the following operations. Metadata section Data section Metadata section Data section Segment lookup finds the container storing the requested segment. This operation may trigger disk I/Os to look in the on-disk index, thus it is throughput sensitive. Container retrieval reads the relevant portion of the indicated container by invoking the Container Manager. Container unpacking decompresses the retrieved portion of the container and returns the requested data segment. 3.3 Container Manager Metadata section Data section The Container Manager provides a storage container log abstraction, not a block abstraction, to Segment Store. Containers, shown in Figure 2, are self-describing in that a metadata section includes the segment descriptors for the stored segments. They are immutable in that new containers can be appended and old containers deleted, but containers cannot be modified once written. When Segment Store appends a container, the Container Manager returns a container ID which is unique over the life of the system. The Container Manager is responsible for allocating, deallocating, reading, writing and reliably storing containers. It supports reads of the metadata section or a portion of the data section, but it only supports appends of whole containers. If a container is not full but needs to be written to disk, it is padded out to its full size. Container Manager is built on top of standard block storage. Advanced techniques such as Software RAID-6, continuous data scrubbing, container verification, and end to end data checks are applied to ensure a high level of data integrity and reliability. The container abstraction offers several benefits. Figure 2: Containers are self-describing, immutable, units of storage several megabytes in size. All segments are stored in containers. 6 The fixed container size makes container allocation and deallocation easy. The large granularity of a container write achieves high disk throughput utilization. A properly sized container size allows efficient fullstripe RAID writes, which enables an efficient software RAID implementation at the storage layer. 4 Acceleration Methods This section presents three methods to accelerate the deduplication process in our deduplication storage system: summary vector, stream-informed data layout, and locality preserved caching. The combination of these methods allows our system to avoid about 99% of the disk I/Os required by a system relying on index lookups alone. The following describes each of the three techniques in detail. 4.1 Summary Vector The purpose of the Summary Vector is to reduce the number of times that the system goes to disk to look for a duplicate segment only to find that none exists. 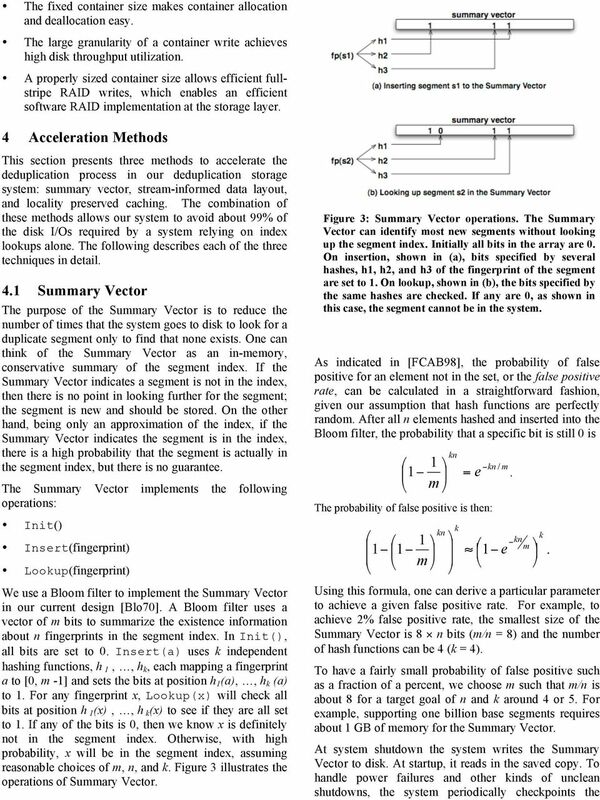 One can think of the Summary Vector as an in-memory, conservative summary of the segment index. If the Summary Vector indicates a segment is not in the index, then there is no point in looking further for the segment; the segment is new and should be stored. On the other hand, being only an approximation of the index, if the Summary Vector indicates the segment is in the index, there is a high probability that the segment is actually in the segment index, but there is no guarantee. The Summary Vector implements the following operations: Init() Insert(fingerprint) Lookup(fingerprint) We use a Bloom filter to implement the Summary Vector in our current design [Blo70]. A Bloom filter uses a vector of m bits to summarize the existence information about n fingerprints in the segment index. In Init(), all bits are set to 0. Insert(a) uses k independent hashing functions, h 1,, h k, each mapping a fingerprint a to [0, m -1] and sets the bits at position h 1 (a),, h k (a) to 1. For any fingerprint x, Lookup(x) will check all bits at position h 1(x),, h k(x) to see if they are all set to 1. If any of the bits is 0, then we know x is definitely not in the segment index. Otherwise, with high probability, x will be in the segment index, assuming reasonable choices of m, n, and k. Figure 3 illustrates the operations of Summary Vector. Figure 3: Summary Vector operations. The Summary Vector can identify most new segments without looking up the segment index. Initially all bits in the array are 0. On insertion, shown in (a), bits specified by several hashes, h1, h2, and h3 of the fingerprint of the segment are set to 1. On lookup, shown in (b), the bits specified by the same hashes are checked. If any are 0, as shown in this case, the segment cannot be in the system. As indicated in [FCAB98], the probability of false positive for an element not in the set, or the false positive rate, can be calculated in a straightforward fashion, given our assumption that hash functions are perfectly random. After all n elements hashed and inserted into the Bloom filter, the probability that a specific bit is still 0 is ' 1 $ % 1! " & m # kn = e The probability of false positive is then: k! kn / m kn & # kn k $ #! ( m $ & ' e! # $ & 1 ' ' 1 ' 1! 1. m % % " " % " Using this formula, one can derive a particular parameter to achieve a given false positive rate. For example, to achieve 2% false positive rate, the smallest size of the Summary Vector is 8 n bits (m/n = 8) and the number of hash functions can be 4 (k = 4). To have a fairly small probability of false positive such as a fraction of a percent, we choose m such that m/n is about 8 for a target goal of n and k around 4 or 5. For example, supporting one billion base segments requires about 1 GB of memory for the Summary Vector. At system shutdown the system writes the Summary Vector to disk. At startup, it reads in the saved copy. To handle power failures and other kinds of unclean shutdowns, the system periodically checkpoints the. 8 by combining the container abstraction with a segment cache as discussed next. For segments that cannot be resolved by the Summary Vector and LPC, we resort to looking up the segment in the segment index. We have two goals on this retrieval: Making this retrieval a relatively rare occurrence. Whenever the retrieval is made, it benefits segment filtering of future segments in the locale. LPC implements a segment cache to cache likely base segment descriptors for future duplicate segments. The segment cache maps a segment fingerprint to its corresponding container ID. Our main idea is to maintain the segment cache by groups of fingerprints. On a miss, LPC will fetch the entire metadata section in a container, insert all fingerprints in the metadata section into the cache, and remove all fingerprints of an old metadata section from the cache together. This method will preserve the locality of fingerprints of a container in the cache. The operations for the segment cache are: Init(): Initialize the segment cache. Insert(container): Iterate through all segment descriptors in container metadata section, and insert each descriptor and container ID into the segment cache. Remove(container): Iterate through all segment descriptors in container metadata section, and remove each descriptor and container ID from the segment cache. Lookup(fingerprint): Find the corresponding container ID for the fingerprint specified. Descriptors of all segments in a container are added or removed from the segment cache at once. Segment caching is typically triggered by a duplicate segment that misses in the segment cache, and requires a lookup in the segment index. As a side effect of finding the corresponding container ID in the segment index, we prefetch all segment descriptors in this container to the segment cache. We call this Locality Preserved Caching. The intuition is that base segments in this container are likely to be checked against for future duplicate segments, based on segment duplicate locality. Our results on real world data have validated this intuition overwhelmingly. We have implemented the segment cache using a hash table. When the segment cache is full, containers that are ineffective in accelerating segment filtering are leading candidates for replacement from the segment cache. A reasonable cache replacement policy is Least-Recently- Used (LRU) on cached containers. 4.4 Accelerated Segment Filtering We have combined all three techniques above in the segment filtering phase of our implementation. For an incoming segment for write, the algorithm does the following: Checks to see if it is in the segment cache. If it is in the cache, the incoming segment is a duplicate. If it is not in the segment cache, check the Summary Vector. If it is not in the Summary Vector, the segment is new. Write the new segment into the current container. If it is in the Summary Vector, lookup the segment index for its container Id. If it is in the index, the incoming segment is a duplicate; insert the metadata section of the container into the segment cache. If the segment cache is full, remove the metadata section of the least recently used container first. If it is not in the segment index, the segment is new. Write the new segment into the current container. We aim to keep the segment index lookup to a minimum in segment filtering. 5 Experimental Results We would like to answer the following questions: How well does the deduplication storage system work with real world datasets? How effective are the three techniques in terms of reducing disk I/O operations? What throughput can a deduplication storage system using these techniques achieve? For the first question, we will report our results with real world data from two customer data centers. For the next two questions, we conducted experiments with several internal datasets. Our experiments use a Data Domain DD580 deduplication storage system as an NFS v3 server [PJSS*94]. This deduplication system features two-socket duel-core CPU s running at 3 Ghz, a total of 8 GB system memory, 2 gigabit NIC cards, and a 15- drive disk subsystem running software RAID6 with one spare drive. We use 1 and 4 backup client computers running NFS v3 client for sending data. 5.1 Results with Real World Data The system described in this paper has been used at over 1,000 data centers. The following paragraphs report the deduplication results from two data centers, generated from the auto-support mechanism of the system. 11 (4) with both Summary Vector and Locality Preserved Caching. The results are shown in Table 4. Clearly, the Summary Vector and Locality Preserved Caching combined have produced an astounding reduction in disk reads. 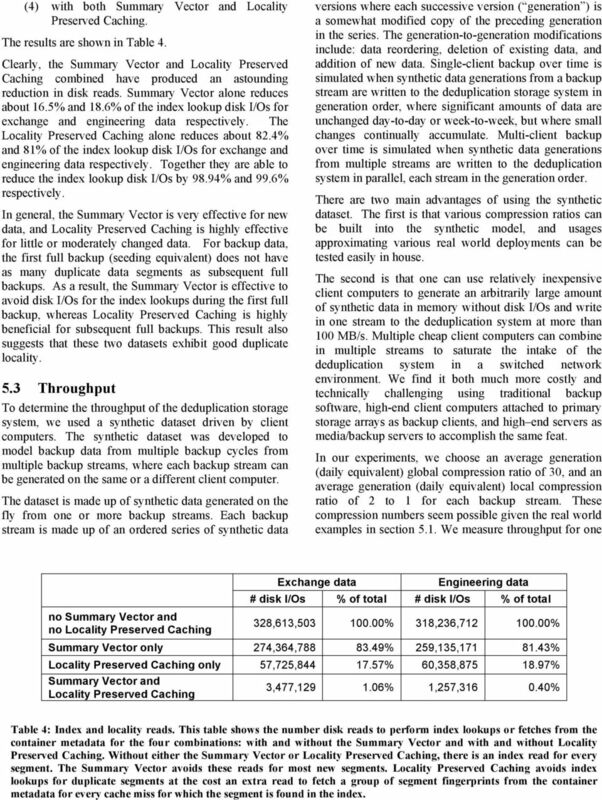 Summary Vector alone reduces about 16.5% and 18.6% of the index lookup disk I/Os for exchange and engineering data respectively. The Locality Preserved Caching alone reduces about 82.4% and 81% of the index lookup disk I/Os for exchange and engineering data respectively. Together they are able to reduce the index lookup disk I/Os by 98.94% and 99.6% respectively. In general, the Summary Vector is very effective for new data, and Locality Preserved Caching is highly effective for little or moderately changed data. For backup data, the first full backup (seeding equivalent) does not have as many duplicate data segments as subsequent full backups. As a result, the Summary Vector is effective to avoid disk I/Os for the index lookups during the first full backup, whereas Locality Preserved Caching is highly beneficial for subsequent full backups. This result also suggests that these two datasets exhibit good duplicate locality. 5.3 Throughput To determine the throughput of the deduplication storage system, we used a synthetic dataset driven by client computers. The synthetic dataset was developed to model backup data from multiple backup cycles from multiple backup streams, where each backup stream can be generated on the same or a different client computer. The dataset is made up of synthetic data generated on the fly from one or more backup streams. Each backup stream is made up of an ordered series of synthetic data versions where each successive version ( generation ) is a somewhat modified copy of the preceding generation in the series. The generation-to-generation modifications include: data reordering, deletion of existing data, and addition of new data. Single-client backup over time is simulated when synthetic data generations from a backup stream are written to the deduplication storage system in generation order, where significant amounts of data are unchanged day-to-day or week-to-week, but where small changes continually accumulate. Multi-client backup over time is simulated when synthetic data generations from multiple streams are written to the deduplication system in parallel, each stream in the generation order. There are two main advantages of using the synthetic dataset. The first is that various compression ratios can be built into the synthetic model, and usages approximating various real world deployments can be tested easily in house. The second is that one can use relatively inexpensive client computers to generate an arbitrarily large amount of synthetic data in memory without disk I/Os and write in one stream to the deduplication system at more than 100 MB/s. Multiple cheap client computers can combine in multiple streams to saturate the intake of the deduplication system in a switched network environment. We find it both much more costly and technically challenging using traditional backup software, high-end client computers attached to primary storage arrays as backup clients, and high end servers as media/backup servers to accomplish the same feat. In our experiments, we choose an average generation (daily equivalent) global compression ratio of 30, and an average generation (daily equivalent) local compression ratio of 2 to 1 for each backup stream. These compression numbers seem possible given the real world examples in section 5.1. We measure throughput for one no Summary Vector and no Locality Preserved Caching Exchange data Engineering data # disk I/Os % of total # disk I/Os % of total 328,613, % 318,236, % Summary Vector only 274,364, % 259,135, % Locality Preserved Caching only 57,725, % 60,358, % Summary Vector and Locality Preserved Caching 3,477, % 1,257, % Table 4: Index and locality reads. This table shows the number disk reads to perform index lookups or fetches from the container metadata for the four combinations: with and without the Summary Vector and with and without Locality Preserved Caching. Without either the Summary Vector or Locality Preserved Caching, there is an index read for every segment. The Summary Vector avoids these reads for most new segments. Locality Preserved Caching avoids index lookups for duplicate segments at the cost an extra read to fetch a group of segment fingerprints from the container metadata for every cache miss for which the segment is found in the index. 13 systems also use file hashes to address files. Some call such systems content addressed storage or CAS. Since their deduplication is at file level, such systems can achieve only limited global compression. Venti removes duplicate fixed-size data blocks by comparing their secure hashes [QD02]. It uses a large on-disk index with a straightforward index cache to lookup fingerprints. Since fingerprints have no locality, their index cache is not effective. When using 8 disks to lookup fingerprints in parallel, its throughput is still limited to less than 7 MB/sec. Venti used a container abstraction to layout data on disks, but was stream agnostic, and did not apply Stream-Informed Segment Layout. To tolerate shifted contents, modern deduplication systems remove redundancies at variable-size data blocks divided based on their contents. Manber described a method to determine anchor points of a large file when certain bits of rolling fingerprints are zeros [Man93] and showed that Rabin fingerprints [Rab81, Bro93] can be computed efficiently. Brin et al. [BDH94] described several ways to divide a file into content-based data segments and use such segments to detect duplicates in digital documents. Removing duplications at contentbased data segment level has been applied to network protocols and applications [SW00, SCPC*02, RLB03, MCK04] and has reduced network traffic for distributed file systems [MCM01, JDT05]. Kulkarni et al. evaluated the compression efficiency between an identity-based (fingerprint comparison of variable-length segments) approach and a delta-compression approach [KDLT04]. These studies have not addressed deduplication throughput issues. The idea of using Bloom filter [Blo70] to implement the Summary Vector is inspired by the summary data structure for the proxy cache in [FCAB98]. Their work also provided analysis for false positive rate. In addition, Broder and Mitzenmacher wrote an excellent survey on network applications of Bloom filters [AM02]. TAPER system used a Bloom filter to detect duplicates instead of detecting if a segment is new [JDT05]. It did not investigate throughput issues. 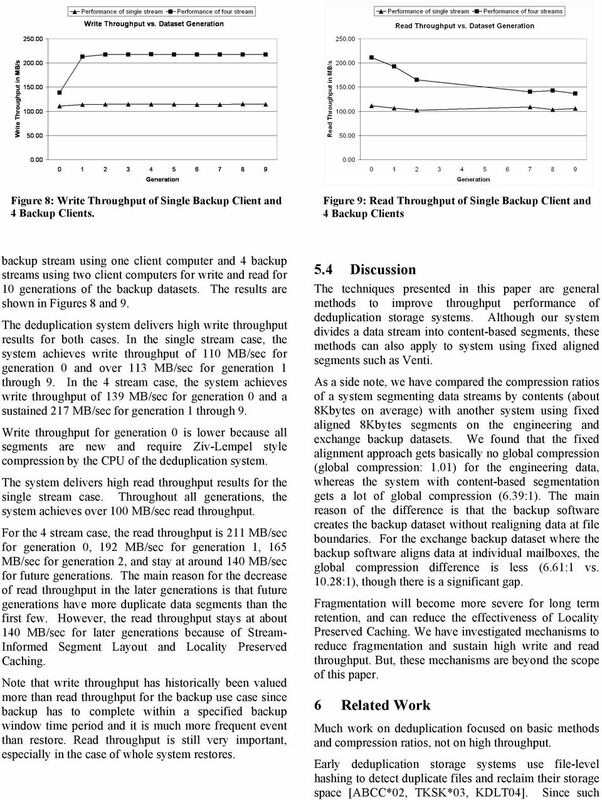 7 Conclusions This paper presents a set of techniques to substantially reduce disk I/Os in high-throughput deduplication storage systems. Our experiments show that the combination of these techniques can achieve over 210 MB/sec for 4 multiple write data streams and over 140 MB/sec for 4 read data streams on storage server with two dual-core processors and one shelf of 15 drives. We have shown that Summary Vector can reduce disk index lookups by about 17% and Locality Preserved Caching can reduce disk index lookups by over 80%, but the combined caching techniques can reduce disk index lookups by about 99%. Stream-Informed Segment Layout is an effective abstraction to preserve spatial locality and enable Locality Preserved Caching. 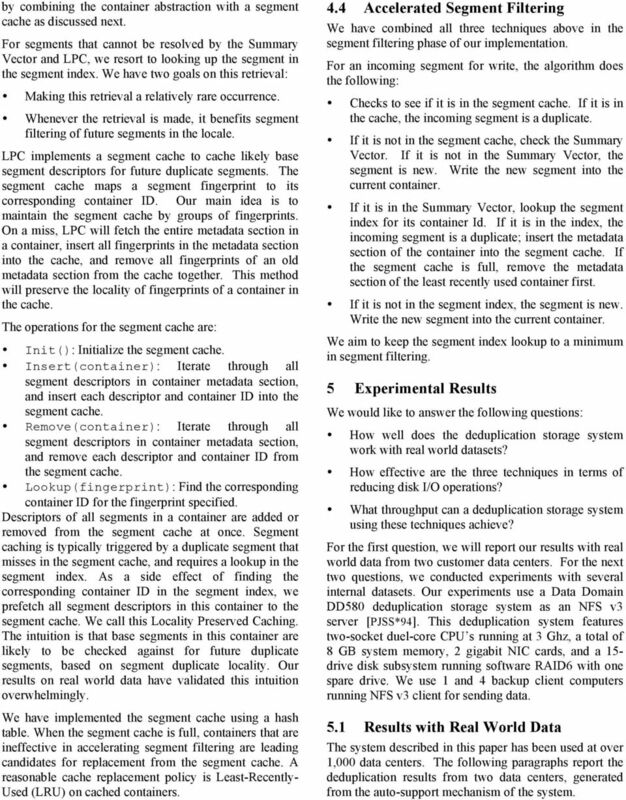 These techniques are general methods to improve throughput performance of deduplication storage systems. Our techniques for minimizing disk I/Os to achieve good deduplication performance match well against the industry trend of building many-core processors. With quad-core CPU s already available, and eight-core CPU s just around the corner, it will be a relatively short time before a large-scale deduplication storage system shows up with 400 ~ 800 MB/sec throughput with a modest amount of physical memory. 8 References [ABCC*02] A. Adya, W. J. Bolosky, M. Castro, G. Cermak, R. Chaiken, J. R. Douceur, J. Howell, J. R. Lorch, M. Theimer, and R. P. Wattenhofer. FARSITE: Federated, available, and reliable storage for an incompletely trusted environment. In Proceedings of USENIX Operating Systems Design and Implementation (OSDI), December [BM05] Andrie Z. Broder and Michael Mitzenmacher. Network Applications of Bloom Filters: A Survey. Internet Mathematics, [BDH94] S. Brin, J. Davis, H. Carcia-Molina. Copy Detection Mechanisms for Digital Documents (weblink). 1994, also lso in Proceedings of ACM SIGMOD, [Blo70] Burton H. Bloom. Space/time Trade-offs in Hash Coding with Allowable Errors. Communications of the ACM, 13 (7) [JDT05] N. Jain, M. Dahlin, and R. Tewari. TAPER: Tiered Approach for Eliminating Redundancy in Replica Synchronization. 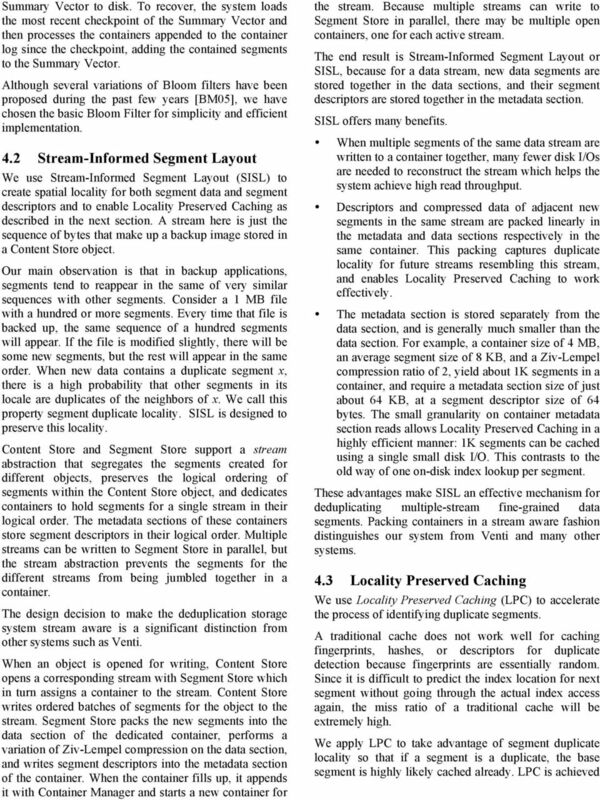 In Proceedings of USENIX File And Storage Systems (FAST), [Dat05] Data Domain, Data Domain Appliance Series: High-Speed Inline Deduplication Storage, 2005, l [FCAB98] Li Fan, Pei Cao, Jussara Almeida, and Andrie Z. Broder. Summary Cache: A Scalable Wide-Area Web Cache Sharing Protocol. in Proceedings of ACM SIGCOMM'98, (Vancouver, Canada, 1998). [KDLT04] P. Kulkarni, F. Douglis, J. D. LaVoie, J. M. Tracey: Redundancy Elimination Within Large Collections of Files. In Proceedings of USENIX Annual Technical Conference, pages 59-72, 2004. 14 [Man93] Udi Manber. Finding Similar Files in A Large File System. Technical Report TR 93-33, Department of Computer Science, University of Arizona, October 1993, also in Proceedings of the USENIX Winter 1994 Technical Conference, pages [MCK04] J. C. Mogul, Y.-M. Chan, and T. Kelly. Design, implementation, and evaluation of duplicate transfer detection in HTTP. In Proceedings of Network Systems Design and Implementation, [MCM01] Athicha Muthitacharoen, Benjie Chen, and David Mazières. A Low-bandwidth Network File System. In Proceedings of the ACM 18th Symposium on Operating Systems Principles. Banff, Canada. October, [NIST95] National Institute of Standards and Technology, FIPS Secure Hash Standard. US Department of Commerce, April [PJSS*94] B. Pawlowski, C. Juszczak, P. Staubach, C. Smith, D. Lebel, and D. Hitz, NFS Version 3 Design and Implementation, In Proceedings of the USENIX Summer 1994 Technical Conference [QD02] S. Quinlan and S. Dorward, Venti: A New Approach to Archival Storage. 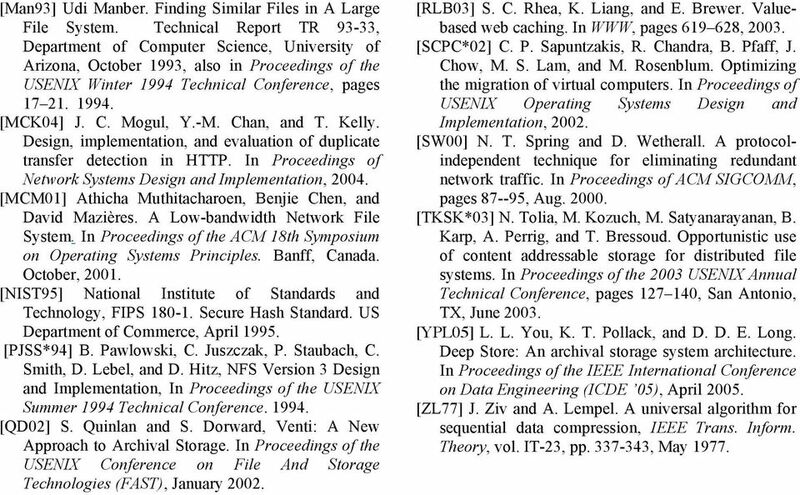 In Proceedings of the USENIX Conference on File And Storage Technologies (FAST), January [RLB03] S. C. Rhea, K. Liang, and E. Brewer. Valuebased web caching. In WWW, pages , [SCPC*02] C. P. Sapuntzakis, R. Chandra, B. Pfaff, J. Chow, M. S. Lam, and M. Rosenblum. Optimizing the migration of virtual computers. In Proceedings of USENIX Operating Systems Design and Implementation, [SW00] N. T. Spring and D. Wetherall. A protocolindependent technique for eliminating redundant network traffic. In Proceedings of ACM SIGCOMM, pages , Aug [TKSK*03] N. Tolia, M. Kozuch, M. Satyanarayanan, B. Karp, A. Perrig, and T. Bressoud. 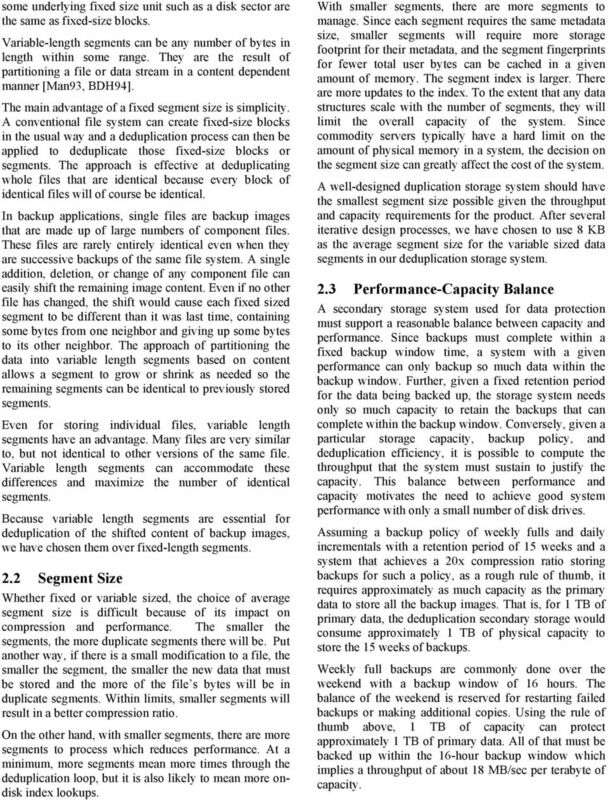 Opportunistic use of content addressable storage for distributed file systems. In Proceedings of the 2003 USENIX Annual Technical Conference, pages , San Antonio, TX, June [YPL05] L. L. You, K. T. Pollack, and D. D. E. Long. Deep Store: An archival storage system architecture. 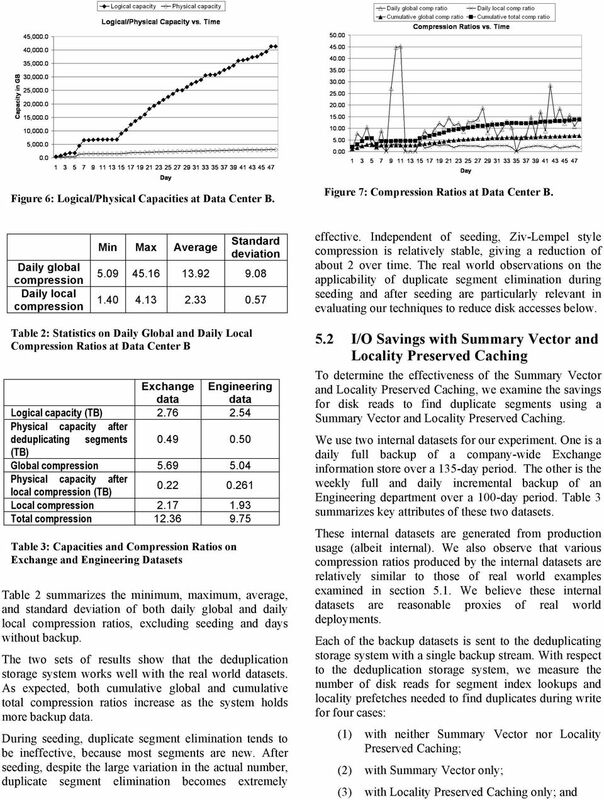 In Proceedings of the IEEE International Conference on Data Engineering (ICDE 05), April [ZL77] J. Ziv and A. Lempel. 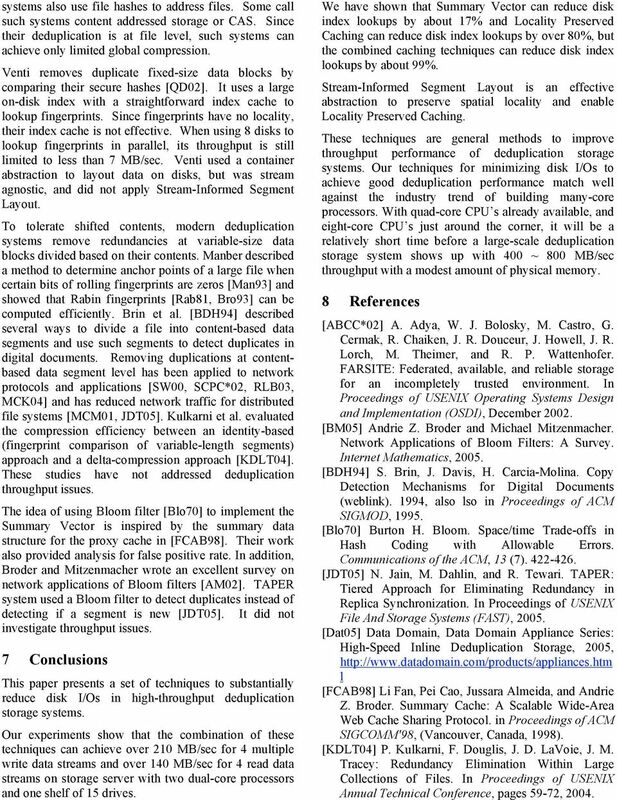 A universal algorithm for sequential data compression, IEEE Trans. Inform. Theory, vol. IT-23, pp , May 1977. Document No. Technical White Paper for the Oceanspace VTL6000 Issue V2.1 Date 2010-05-18 Huawei Symantec Technologies Co., Ltd. Copyright Huawei Symantec Technologies Co., Ltd. 2010. All rights reserved.